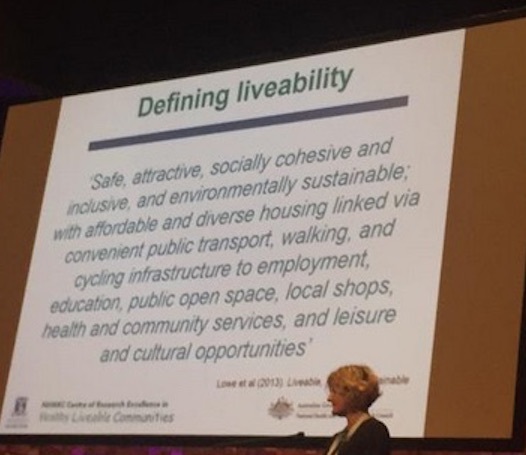 Adequate housing, active transport and liveable environments are important for the community’s health and wellbeing, the Population Health Congress 2015 heard yesterday. But climate change is the most important concern of all. Should rental housing have to earn a “warrant of fitness”? That’s what the New Zealand Government is considering, following the death in 2014 of a two-year-old Wellington girl whose family couldn’t afford to use a heater to warm their leaking, cold home. The case focused renewed attention on poverty in New Zealand – as a “real thing that kills people”, as one media outlet put it, and on substandard housing after the investigating coroner said he could not ‘exclude’ that it was a contributing factor to her death. 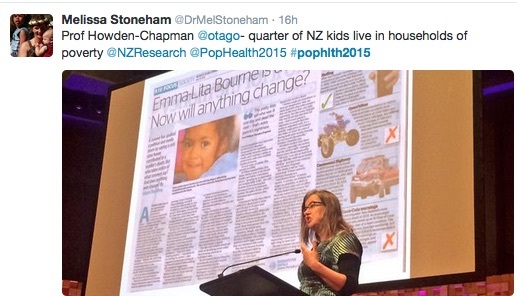 The little girl was not alone, Professor Philippa Howden-Chapman from Otago University in Wellington yesterday told the Population Health Congress plenary on ‘healthy places, healthy spaces’. She said about 25 per cent of New Zealand children live in poverty, and nearly one in five adults has reported “feeling cold to save on heating”. But she detailed work done over the past decade that has shown even basic changes to housing can produce significant health and environment gains, as well as being very cost effective. 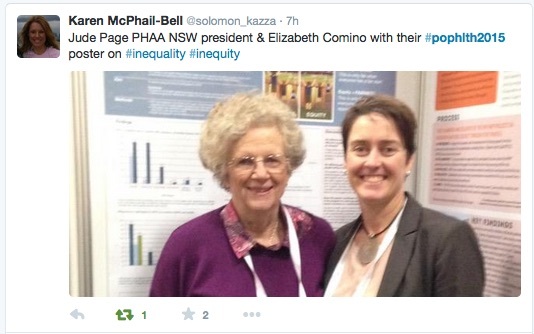 It is research that will likely interest Australian housing advocates who have campaigned for years for minimum standards for rental housing, while programs for energy efficiency in disadvantaged housing have been wound back over recent years. 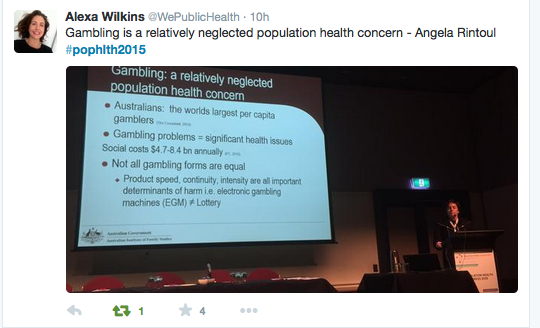 It may also prompt wider input from the health sector into those campaigns. The importance of housing as a major determinant of health was also highlighted in a keynote address from Greens Leader Senator Richard Di Natale. 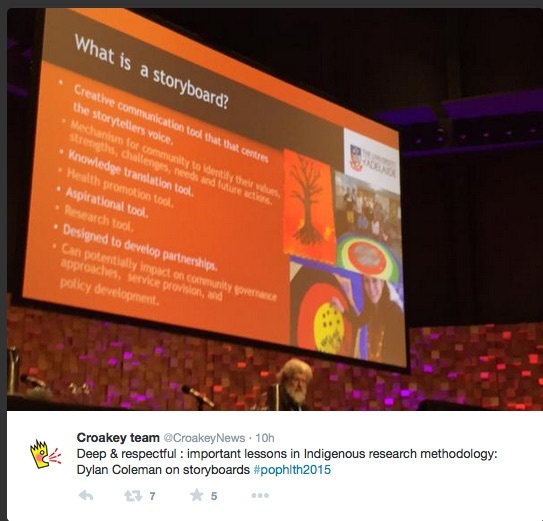 The former GP and public health advocate got a very warm welcome on day two of the conference, though he had to withdraw from a panel session to return to Canberra where the Federal Government’s refugee policies were under fire. See more on his speech below. 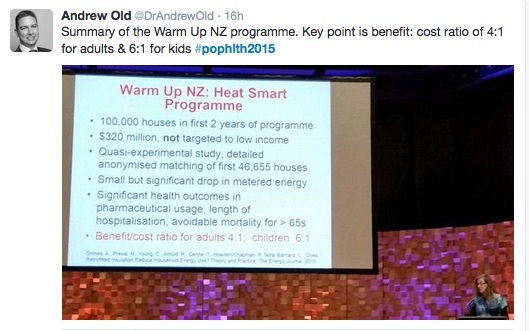 Howden-Chapman, who is professor of public health at the University of Otago in Wellington, outlined the results of the 2008 Housing Heating Health project. This looked at the effects of improved home heating – by retrofitting insulation and replacing old gas or bar heaters – on asthma in children through a randomized controlled trial carried out over a number of years. It delivered impressive health benefits, she said, including fewer days off school, much less wheezing and coughing and fewer hospital admissions. “We were able to show conclusively that if you retrofit houses and add heating it has a very beneficial effect on the children,” she said. Examination of school records showed that children whose homes were improved had two fewer sick days. It also delivered a healthy benefit to cost ratio. “That final piece of information convinced Cabinet to act,” she said, leading to the Warm Up New Zealand Heat smart program that retrofitted 100,000 homes and also delivered strong results. Howden-Chapman has also been involved in a pre-test of a ‘rental warrant of fitness’ in five council areas in Wellington, assessing housing on a broad set of features that were considered to have an impact on health, safety and energy efficiency. “Most houses failed,” she said. It pointed to growing concerns about the state of private rentals in New Zealand, with the conservative government committing to sell 30 per cent of public housing. There are similar concerns about standards here. But she said projects like Housing Heating Health showed that governments could be convinced by evidence and that very basic programs can deliver “a lot of co-benefits”. 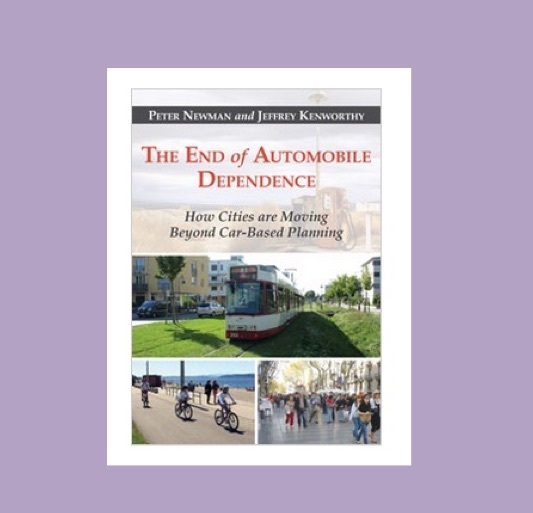 We may be heading into a new era in urban planning, according to Curtin University professors Peter Newman and Jeff Kenworthy who have just released a new book: The end of automobile dependence: how cities are moving beyond car-based planning. 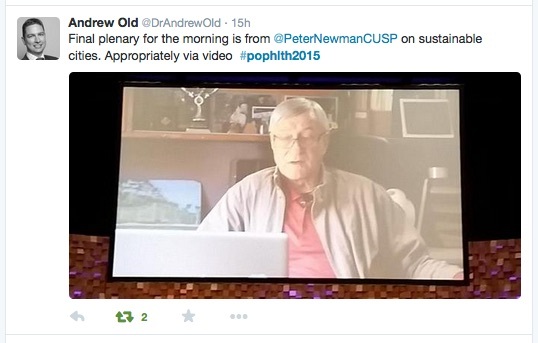 “We have turned the corner on the car,” Newman told the conference by video. Newman’s book says we are experiencing the phenomenon of ‘peak car use’ in many global cities at the same time that urban rail is thriving, central cities are revitalising, and suburban sprawl is reversing. “This is a very big difference. Most developed cities are showing a decline in vehicle kilometres travelled per capita and even total automobile travel, but are still dominated by the car. In these cities there is still no real option other than a car in most parts of the city. That’s as long, Newman said, as governments invest in alternatives. Meanwhile, Dr Hannah Badland, Senior Research Fellow from the McCaughey VicHealth Community Wellbeing Unit at Melbourne University, said urban sprawl had seen a separation of planning and health. It had led to people shifting out to suburbs where they had become highly reliant on cars, and vulnerable to the cost of fuel. 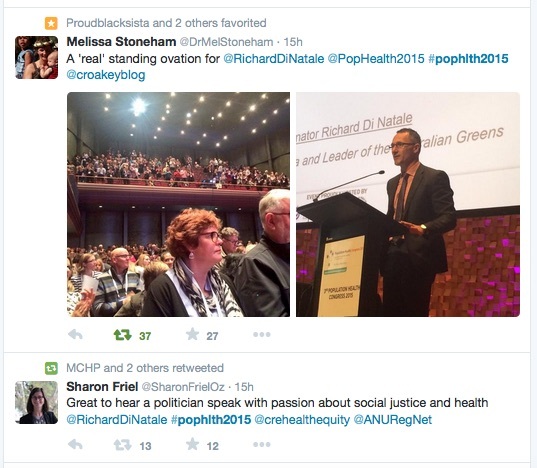 As Croakey reported on his election as Greens Leader, Di Natale may have been “little known” in the mainstream media at the time but he has long been well known in health circles. He told the conference he was guided by the work of Sir Michael Marmot, whose work on health inequalities was “the holy grail”. “If we are going to make progress…we have got to ensure access to decent housing, education, clean air and water, employment and meaningful participation in community life,” he said. But most important, he said, was climate change. Di Natale said he welcomed the current debate over health care funding that, unintended, was developing into a discussion about the sort of society and health system we want. The ageing population was often given as the major cause of burgeoning health costs, but it was not as significant as advances in health technology that were giving people access to new equipment, treatments, and medicines. 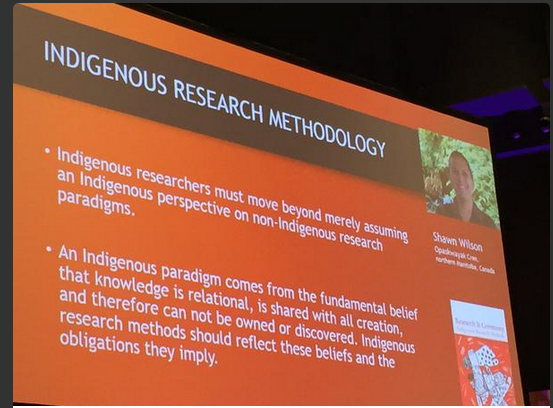 Finally, a poignant insight from one of the concurrent sessions from former pharmacist John Aitken, who reported on a community action research group in rural Victoria asking people to identify places that they found healthy or unhealthy. The place ‘baby boomers’ felt least healthy was “at the front door of their parent’s house”, he said. Dealing with issues ranging from dementia to general frailty, they “didn’t know what they’d see inside the door on a week by week basis” in terms of stress and arguments. 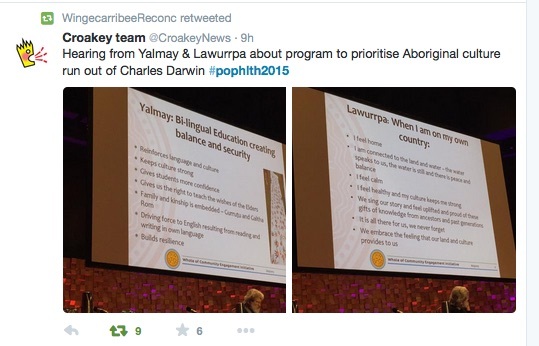 Meanwhile, this tweet highlights other age-related concerns. 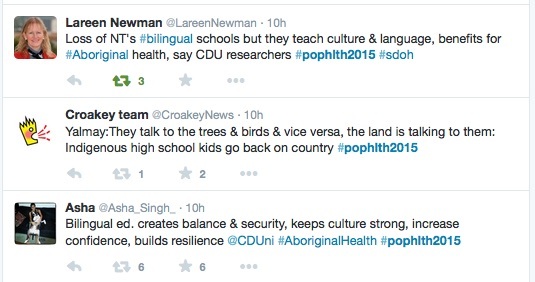 Croakey will report more on the day’s discussions but in the meantime, some highlights from Twitter. 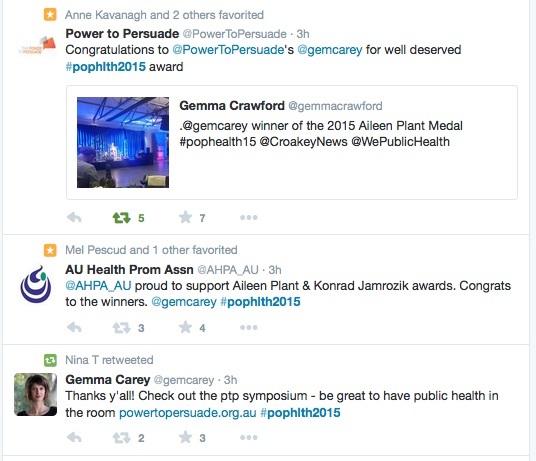 See also this Twitter summary from Bernadette Keefe.